Adam Scott : The Two-Way Australia's Adam Scott won in a dramatic two-hole playoff with Argentina's Angel Cabrera. The consensus is that one of golf's most-liked guys has now won his first "major." 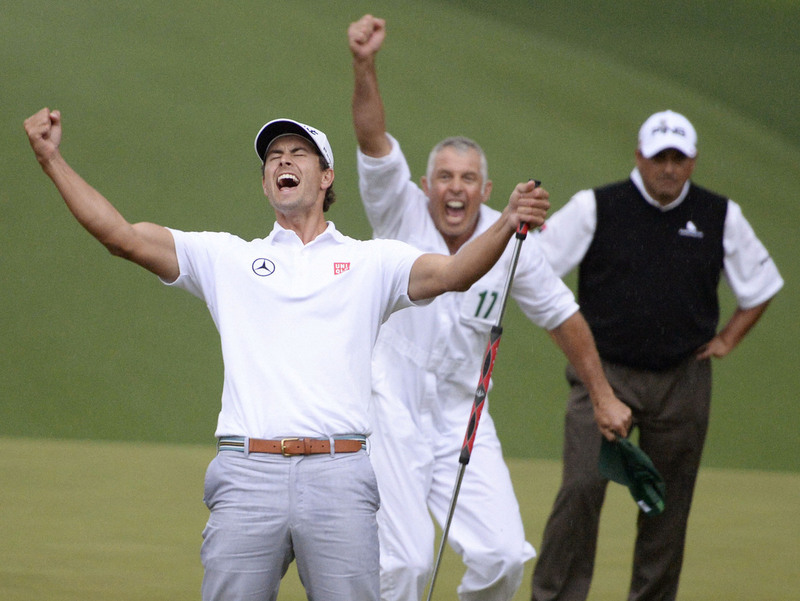 Adam Scott (left) of Australia celebrates after winning a playoff against Angel Cabrera (right) of Argentina at the Masters golf tournament in Augusta, Ga. In between them is Steve Williams, Scott's caddie. -- "He's one of the 10 nicest guys you'll ever meet," writes ESPN's Gene Wojciechowski. "Everybody — women, corporations, his native Australia — loves him. And now, at long last, so does a major." -- "This was a great day for Australian golf," says Sydney Morning Herald sports columnist Richard Hinds. "Mostly, it was a great day for Adam Scott. A day when a nice guy finished first." -- "Adam's a good winner," Cabrera said Sunday night. "I would have been happier if I had won, but he's a great player, I get along with him, we've played together in the President's Cup, and I'm happy for him." "It is Monday in Melbourne, but all of Oz awoke to an unofficial, impromptu holiday. Australia's long Masters nightmare ended on a rainy Sunday. On a day ready-made for a duck, Adam Scott outlasted Angel 'El Pato' (The Duck) Cabrera to end the 'Aussie Duck,' the cricket term that means zero, which was the grand sum of green jackets collected before Sunday's wet and wild finish." -- Another Australian, Jason Day, finished third. He was 7-under par. -- Tiger Woods finished tied at fourth. He was 5-under par. -- Tianlang Guan, the 14-year-old from China who's the youngest person to ever play in the Masters, finished 58th. He was 12-over par. NPR's Tom Goldman reported about the Masters earlier for Morning Edition.